Before we get to the dandelion coffee, or should I say dandelion “coffee,” let’s learn a bit about dandelion. Volumes could be written on the many uses of dandelion (Taraxacum officinale) – indeed they have been! This common weed is often hated and poisoned by those preferring a “weed free” lawn, while those of us in love with dandelion and its many uses happily support it taking over our lawns. This plant was purposefully brought to North America by Europeans not wanting to leave this valuable resource behind. Every part of the dandelion can be used as food or medicine, making back door herbalism simple and easy, as it should be. When the first spring leaves pop up out of the ground they can be harvested heavily and eaten fresh with salads, made into a delicious pesto, or dried for tea. The leaves are highly nutritious, containing large amounts of vitamin A, calcium, potassium, and many more vitamins and minerals. The French call this plant pissenlit, which alludes to its strong diuretic properties. When eaten with meals, the bitter taste of the leaves helps to promote digestion by stimulating bile to relieve indigestion and other digestive disturbances. The root is a great ally for the liver. It can be tinctured or eaten fresh in a variety of recipes. We’ll see below how to make dandelion coffee. Dandelion root can help clear up acne and other skin disruptions with the root cause being a stagnant liver. Most herbalists agree that long-term use of dandelion is needed for best results. The flower can be eaten in salads, or fried up as fritters. An oil made from dandelion flowers is warming and can be applied externally to relieve arthritis and other aches and pains. Lastly the latex, or sap, from the dandelion stems can be used topically on warts. Apply several times daily for best results. 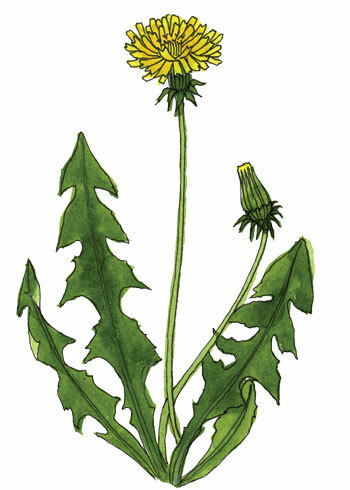 Like burdock, dandelion’s strong diuretic activity makes it an inappropriate choice for someone with low blood pressure or excessive urination. My favorite way to enjoy dandelion is by making dandelion coffee with the roots. This beverage doesn’t contain the caffeine found in coffee, but does have a rich, dark taste similar to coffee. Prior to decocting the dandelion root, roast the dried chopped root in a cast iron pan until it is fragrant and has changed color from being off-white to light and dark brown. For each 8 ounces of water you are making, use 1 to 2 teaspoons of the roasted root. Add the root to simmering water and continue to simmer while covered for 7 to 15 minutes. The resulting brew will be darkly colored. I enjoy my dandelion coffee with cream, and many people enjoy adding honey as well.